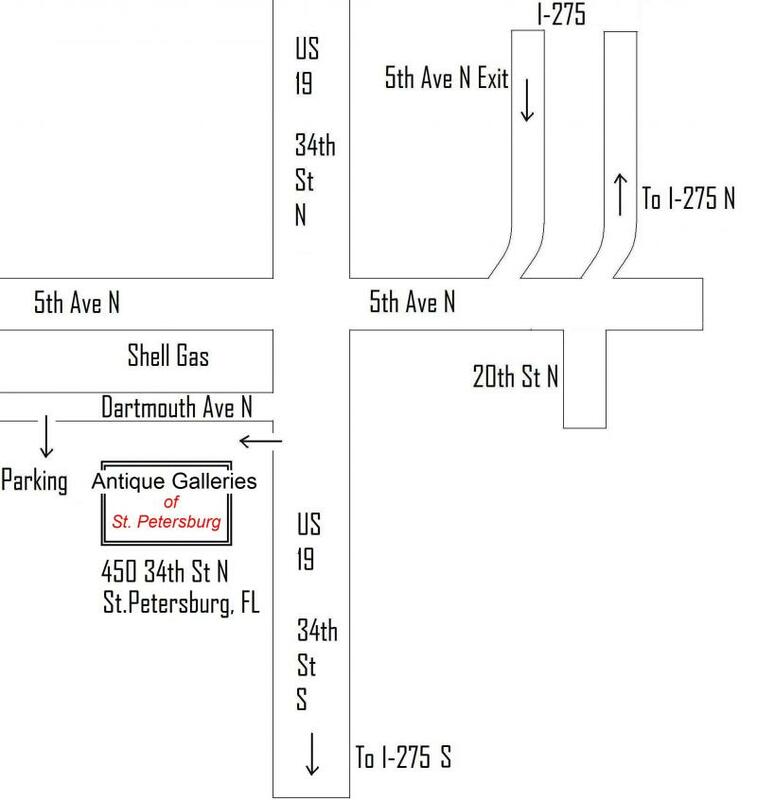 Antique Galleries of St. Petersburg - Contact Us and Directions For more informationPLEASE CALL (727) 321-3331 FAX (727) 321-6333 Email AGofSP@Yahoo.com We are open 7 days a week, including Mondays, and almost all holidays.﻿ Like us on Facebook and get exclusive updates. 5/26/2012 Memorial Day Weekend, "Spring Fling"
Like us on Facebook and get exclusive updates. We have lots of free parking. We own this two-story former bank building of 16,000 square feet. We have lots of free parking for your convenience. For handicapped needs, we have a ramp and an elevator. Move your mouse over the directions below and click the bottom-right "+" to enlarge. Copyright 2014 Antique Galleries of St. Petersburg. All rights reserved.